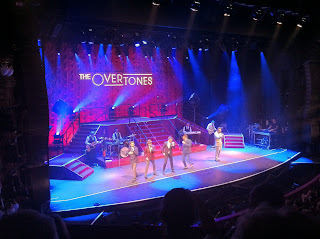 The last time I saw The Overtones playing live was at Magic Summer Live at Hatfield House, alongside Elton John, The Lighthouse Family, The Pierces and more. 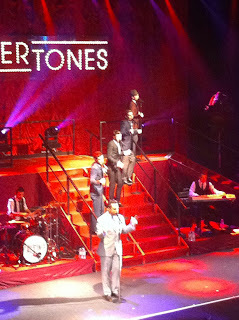 On that occasion, they were really good, this time round at London Palladium, they were even better! London Palladium was sold out, and with support from Sam Gray, the audience were treated to a great evening of live music. Darren, Mark, Timmy, Mike and Lachie each entered the risen stage, silhouetted in a single spot for a stance on the beat of the opening music. Opening with Gambling Man and Come Back My Love, The Overtones were in fine form with their superb harmonies and vocals sounding sweet as a nut. The hits kept coming all night, Good Ole Fashioned Love, Blue Moon, Say What You Feel, Still Of The Night getting rapturous applause from the all ready excited audience. The boys went into the audience to sing For The Longest Time, whilst a leather sofa was placed on stage for the next set, an acoustic version of I Need a Dollar, followed by a very clever acapella version of the Spice Girls hit Who Do You Think You Are. Cee-Lo Green's Forget You was next to be given The Overtones treatment, getting the audience up on their feet dancing away - ShBooom! A nice version of The Beatles We Can Work It Out was a pleasant surprise to the set list. Rounding up the evening with Goodnight Sweetheart, and their latest single Second Last Chance, an encore was inevitable, and they delivered Why Do Fools Fall In Love, with everyone on their feet singing and dancing away. A fabulous evening of entertainment, The Overtones definitely know how to put on one hell of a show.